When Nick goes away on business trips the very hardest time for me is between about 5pm and bedtime. When he's away... Zoe and I get a little stir crazy (and tired of each other) during that time. So, Nick went to Calgary for a week. On a particularly hard day that included an early wake up, a lot of whining, and a short nap I felt like I couldn't take another minute and would never ever make it to bedtime. So at 6:30 I rushed Zoe into her pajamas and headed to the movies for a "new and exciting experience" for Zoe. TiVo occasionally offers up an option to watch movie clips. 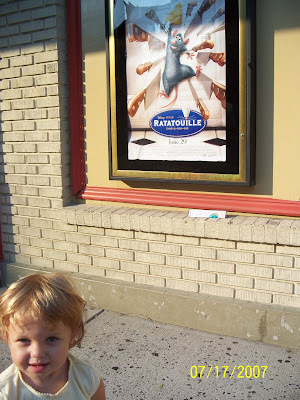 The week before the movie opened, they had a 9 minute clip of Ratatouille. We watched it once and from that moment on Zoe was slightly obsessed with "mouse mouse". Every time the TV was turned on she would ask "mouse? mouse?" So we watched it a few (hundred) times. I figured if she (and I) could watch a 9 minute clip a dozen times in a row... we'd enjoy the whole movie quite a bit. Zoe was pretty excited about the poster. "Look Mommy, look mouse!" So I purchased the overpriced movie tickets, the overpriced popcorn and the overpriced drink, and in we went. Zoe was little confused at first. The facial expression was one of "hey, why are we sitting here in this big chair in this big room?" 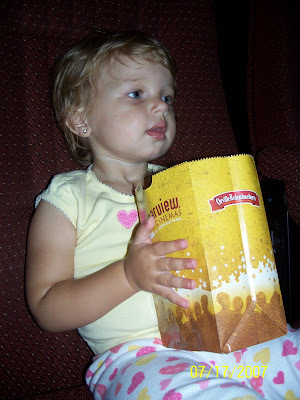 But, once the previews came on she was in awe of the very very large "TV" and made herself comfy in the movie chair. That lasted for about 10 minutes... right until the "scary" scene where the old lady who lives on the farm uses her shotgun to chase away the enormous family of rats during a very loud thunderstorm. That caused a little bit of anxiety... so her new seat became my lap. Once that part was over Zoe settled down and enjoyed the movie. Well... she enjoyed 80 minutes of a 110 minute movie. Then she got confused as to why she couldn't get up and walk around and chat with the other kids. So before it got ugly (with a toddler being forced to sit with screaming and kicking and screaming) I called it a night. As we left Zoe perked right up and chatted and laughed and enjoyed our walk back to the car. As I buckled her into the car seat she looked at me and smiled the sweet little smile that I just love... and proceeded to say "more mouse mommy? me see more mouse?" Oh well, I wonder how soon I can add it to the Netflix list. Wordless Wednesday - I might be f-f-f-freezing!